Single mom and veterinarian Natalie DeAngelo lost everything the day her two sons were killed in a school shooting. Following her psychiatrist's advice, she decides to sell her once-happy home to escape the immense pain and grief of living there alone. Desperate to find relief from her unspeakable loss, Natalie impetuously commits to honoring her boys’ memory and volunteers to assist philanthropist Andrew Graham at his elephant sanctuary in northern Thailand. All she wants once she gets there is relief. But she soon realizes she may be in over her head when she faces three major challenges: her debilitating PTSD is creating night terrors; Peter Hatcher, the sanctuary’s irascible in-house vet, has a longtime grudge against her and wants desperately for her to fail; and Sophie, a female elephant with a raging leg infection and PTSD caused by human abuse, is demanding that Natalie use every trick in her veterinarian’s black bag to heal her. Dr. Hatcher wants to euthanize Sophie, as he claims she's a lost cause, and Natalie knows she must find a way to convince the others to let her keep trying. Can she and Sophie find a way to heal together and learn to love life again? Or will another tragedy shatter Natalie's progress? I have never read a book even remotely similar to The Mourning Parade. It tugged on my sensitive heartstrings which to me is always a great sign of a fantastic story. One of the things I really loved about the story were the parts written in the point of view of Sophie the elephant. That sounds contrived, but it added so much to the overall story. The bond between Sophie and Natalie is a true love story, and there are many other sub plots to keep you turning the pages. There was a little bit of a twist at the end that I didn't expect and that is another good sign for me as a reader that I have found something special. 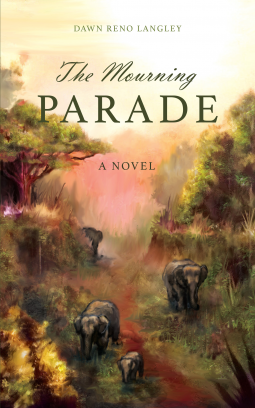 The Mourning Parade is the type of book I would recommend to my book club, so I recommend you do the same! This type of book begs to be discussed. If you don't have a book club, start one! Or read it with a friend and discuss!